Our life as monks at the Abbey is a gentle and regular rhythm of prayer and work. In addition to gathering six times each day to pray together, we spend time alone in contemplative prayer, spiritual reading (lectio divina) and personal devotions. Silence is diligently cultivated in the monastery, especially at night, to maintain a prayerful quiet in the house of God and in the souls of the monks. The Hours of the Divine Office are chanted in common with the Eucharist as the high point of our monastic day. 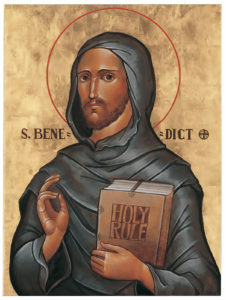 In his Rule, our Holy Father Saint Benedict teaches that “nothing is to be preferred to the Work of God” (43:3). Nothing is to be preferred to the liturgical prayer of the Church. At Mount Angel Abbey, the Hours of the Divine Office are chanted in common, with the celebration of the Holy Eucharist as the center and high point of the monastic day. Throughout the day an atmosphere of quiet prayer and reflection prevails in the monastery. Life for the monks of Mount Angel Abbey is a gentle and regular rhythm of prayer and work. Besides gathering in the church six times each day to pray together, the monks spend time alone in contemplative prayer, lectio divina, spiritual reading and personal devotions in the quiet of the monastery. Silence is diligently cultivated in the monastery, especially at night, to help maintain a prayerful quiet in the house of God and in the souls of the monks. At the center of a monk’s life are prayer, work and Christian brotherhood. Our Abbey’s principal apostolic works are the operation of Mount Angel Seminary, Saint Benedict Guesthouse and Retreat Center, the Abbey library, and pastoral ministry. Each monk brings his gifts to the monastery, and all kinds of work are valued and shared. There is work in the kitchens, on the grounds and in the laundry, as well as, positions of management and administration. The seminary provides opportunity to study and teach. Of special value, are the arts – music, iconography, painting, woodworking, calligraphy, mosaic and graphic arts, and, of course, the work of pastoral care, preaching, sacramental ministry, spiritual direction and parish assistance. Personal presence, friendship, recreation and conversation are important elements of our community life. The monk is not alone in his search for God and in his desire to be conformed to Christ. Through communal living, we learn to assist and to support one another. We particularly experience fraternity as we pray, work, relax, recreate and study together. The monks of this monastery take the monastic vows of obedience, stability and “conversatio morum,” that is often translated as “conversion of life” or morals. Our obedience is to Christ and his Church. We live this obedience under a Rule and an abbot. The abbot rules the monastery more by example than by legislation; the Holy Rule is an assistance and guide in following the Holy Gospel. Stability has been described as the vows that stops us from running from the cross. Community life lived in charity is a great deal of hard work. When faced with challenges, sometimes we’d like to run away, but God always supplies sufficient grace and love to resolve our human difficulties, and in the process, be gradually transformed. The vow of “conversatio” is a promise to daily follow the monastic way of life, which is very much about conversion. If the Holy Rule presumes anything, it likely is that by God’s grace, and our cooperation with it, change is possible. Over the years, even entrenched vices can be transformed into virtues. Michael Casey, O.C.S.O. & David Tomlins, O.C.S.O. Office of Lauds 6:30 am. Right Reverend Jeremy Driscoll, O.S.B. Very Reverend Vincent Trujillo, O.S.B.